Okay, I did not pack this for S’s lunch. She hates mushrooms. If she thinks she sees so much as a sliver of one in her food, it stops her cold in her tracks. However, C loves, loves mushrooms. And he’s not picky about the variety, and whether they’re raw or cooked, so he happily eats plain button mushrooms (which he piles high on his plate at a salad bar), shitakes, creminis or big fat portobellos. I love that he loves them because mushrooms are packed with vitamin B-2 and D, copper and potassium. After picking C up from preschool today, I decided we’d head home for lunch. I knew there were two portobello mushrooms waiting for us in the fridge. They were left over from a vegetarian craving I had the other night. I didn’t want meat, but I still needed something hearty. Portobellos were the answer. I first made the stuffed mushrooms a couple years ago for my book club, and they were so good I bookmarked the recipe. The portobellos are first marinated in olive oil, balsamic vinegar, garlic, soy sauce and a few sprigs of fresh thyme. Then, they’re roasted gill-side down in the oven for 15 minutes. 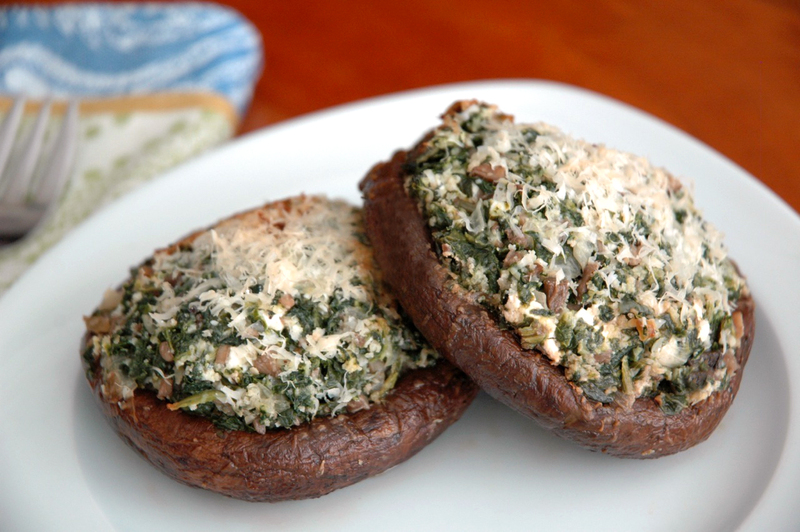 After that, you flip them over and stuff them with a mixture of spinach, goat cheese, parmesan cheese, onions, chopped mushrooms and breadcrumbs. Simply leave out the breadcrumbs if you’re on a gluten-free diet. It won’t change the consistency much. Put them back into the oven for another 15 minutes. The result? A perfect umami flavor. As strange as this might seem, I’ve been eating the leftover portobellos for breakfast. I top each with an over-easy egg for a dense, low-carb meal. As for S, she got turkey and avocado on an everything bagel.